There's something special about the way the light floods into my home that signals Spring has finally arrived. I was sitting on the couch one day in late April (under a cozy blanket as there was still a wee chill in the air), looking through magazines while sipping on a latte and as I looked around my living room, I noticed 'that light' was filling the room and a huge smile came across my face! SPRING!! This is from our first sunset at the lake this Spring....we lost Dad two years ago and we started a tradition of going to the lake (one of his favourite places) on his anniversary. It was such a beautiful night and this handsome guy enjoyed the quiet and tranquil evening just as much as Mom and I did. I'm a huge fan of visiting lake/cottage towns on the 'off season', before they get crazy busy. A good friend and I did a road trip to Muskoka a few weekends ago and we had to stop in Bracebridge to get a closer look at this insanely fast running/crashing water! I posted a video on my Instagram and the sound alone, let a lone the sight of it, was enough to take your breath away! This is one of my favourite sections of the sideroad, just down the road from the Country House. This span of trees looks amazing in any season, but we happened to drive down literally just as the leaves had 'popped'. Soooo pretty! And....the farm on the right has a Clydesdale foal that I have to stop and say "Hi" to whenever I drive by. This is my first Spring with this handsome guy and it's been interesting to watch the transformation of his coat through the seasons. He went really dark, almost black, over the winter, but now that he's shedding his coat (and my goodness, I had forgotten how much fur a draft horse grows for the winter), he's turning back to his reddish/bay colour I knew from last summer. As he was standing there in the rays of the sunset the other evening, I couldn't help but capture this image as it really hilights the beautiful tones of his coat. Spring is also a time of surprises. Whether it's tulips that randomly sprout up after being 'relocated' by the squirrels, or a plant that made it through the winter that you were afraid wouldn't, it's always fun to see what 'springs up' this time of year. I moved into my home in August and when the next Spring came around and I realized I had this beauty outside of my front door, I literally squealed with delight! From what I can tell, its an ornamental crab apple tree and its blossoms are absolutely GORGEOUS!!!!! Just as they're wrapping up, my beautiful and fragrant Korean Lilac on the other side of my front entryway comes into bloom...... Oh how I LOVE Spring!!! Is it just me, or has time moved to fast forward mode? It seems like just yesterday it was April, the new deck was being built and I was looking forward to a Summer of sun and fun! It is now Fall, I have no idea where Summer went (not that it wasn't full of sun and fun), but my gosh, before we know it, it will be Christmas. Don't get me wrong, I had a great Summer. Lots of things going on, new beginnings, new adventures, time spent with old friends and new friends, but most of all....new memories have been made and for that, I'm grateful! As I mentioned above, it was time for a new deck. A great crew of guys spent 3 days in April, through snow and rain (yes, remember how chilly April was) and built me my gorgeous new sanctuary! I had been waiting 5 years for this so I thought, hey, if I'm getting a new deck, I should likely get some new outdoor furniture too. After a ridiculous amount of research, looking, scouting etc, I ended up with this sectional/dining set from JYSK as well as 2 new loungers. Many an afternoon/evening were spent back here, either with friends, family or in perfect solitude. This was truly my early summer hi-light and I'm looking forward to the many years of enjoyment still to come! It wouldn't be a Southwestern Ontario Summer without time spent at the lake....Lake Huron that is. From Southampton to Port Elgin, Kincardine to Goderich and of course Bayfield, all of these beautiful lake towns were frequented on various weekends. There were pizza picnics, shopping sprees, sunsets, sand between our toes and the glorious sunshine on the days we got in the car and headed to this body of water that has drawn me to it every year for the past 37 years. I feel very fortunate to have grown up quite close to these towns and this lake and am even more grateful that I still get to enjoy them in all of their glory today! Whether it was beside a camp fire, a night at the races or on a golf course, there sure was a lot of laughter (and even a few tears) this summer. We all need more laughter in our lives! From old stories, to crazy horse names, to realllllly bad drives off the tee, it's been really nice to have tears of joy run down my cheeks as I'm surrounded by those that mean the most! I spent a lot of time with just me, myself and I this Summer too (that does happen when you live by yourself I suppose), but I really do cherish that time to myself. Whether I'm reading, organizing, making lists, planning or just lying in the sun on a lounger on the deck, this time for 'me' is so critical and important. It was a summer that helped me realize what's truly important to me on many levels and evenings spent like the one pictured above on the back patio, have helped me re-focus and realize what matters most! I hope you all had a wonderful Summer and cheers to the change in seasons ahead! I'm lounging in bed listening to Ray LaMontagne's 'For the Summer' and it hits me just how quickly this Summer flew by! I know we say this every year, but this year it has literally gone by in a blink of an eye! The photo above was taken one early Summer evening at the country house and Charlie and I were both enjoying just lying in the freshly cut grass, taking in all that is country living (and he was also on high alert due to all the bunnies hopping around us). Charlie loves going to the lake just as much as I do. He spent an afternoon swimming in the waves and it was like my 10 year old was a puppy again. I practically had to drag him back to the truck...he didn't want to leave! I seem to have spent a lot of time at the lake this Summer.... Port Elgin, Sauble Beach, Bayfield, Kincardine.....the shores of Lake Huron are one of the places I love to escape to whenever I can. A friend and her family and I spent a day at MacGregor Point Provincial Park. We hiked along the shore line, waded in the water and had a nice relaxing evening by the fire.... It was time to put our feet up after walking 20,000 steps that day. 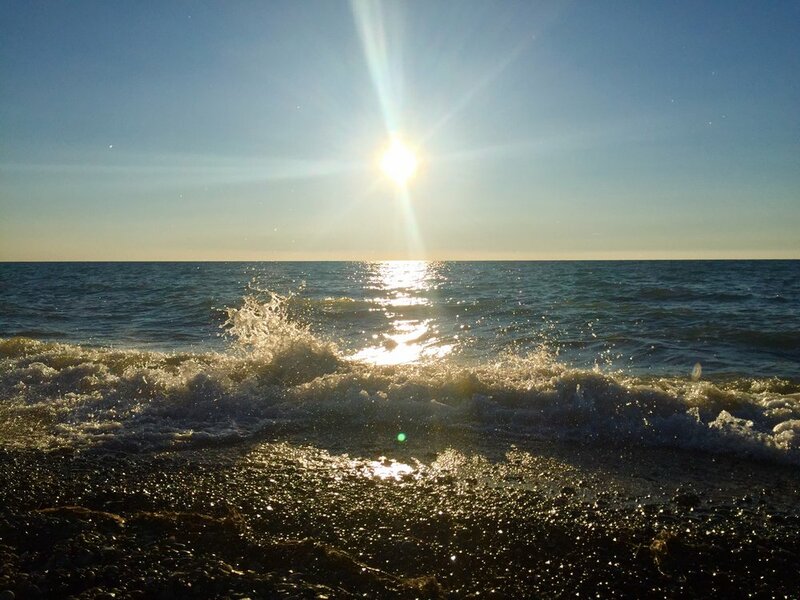 We also watched the sunset and was it ever spectacular!...I've written about this before, but you will be hard pressed to find a more beautiful sunset then those you can watch along the shore of Lake Huron! We also had our second annual Gals Week at the cottage in Sauble Beach. It was a week of amazing weather, lots of sunshine, sand between our toes, frosty beverages, some shopping and again, enjoying all the beauty that the shore of Lake Huron has to offer. It was such a great week and I can't wait till next year! It was also a Summer of 'get togethers'....whether it was a potluck brunch at a neighbour's house up the street (isn't that a scrumptious looking spread above?) or a night with gal pals with pizza and taste testing some local craft beer, it was so good to be able to get together with those that matter most! It was also a Summer that included a lot of gardening! The gardens at the Country House were expanded and we made many stops at local garden centres, such as Wild Things near Clifford Ontario, to help fill the space around the house..There's something almost therapeutic about getting your hands dirty, putting the plants in the ground, watching them grow over the Summer and seeing how the garden changes as the Summer extends into Fall. And of course, it wouldn't be Summer without nights out on my back deck. I didn't spend as much time out there as I would have liked to this summer, but when I did, it was so relaxing and it allows me to forget that I live in the middle of a city. I hope you had an amazing summer too....and cheers to the sweater and boots season that lies ahead! Withdrawl of the feeling of sand between my toes, of morning walks along the shore, of campfires, of lounging & reading in the sunshine and most of all...this view! 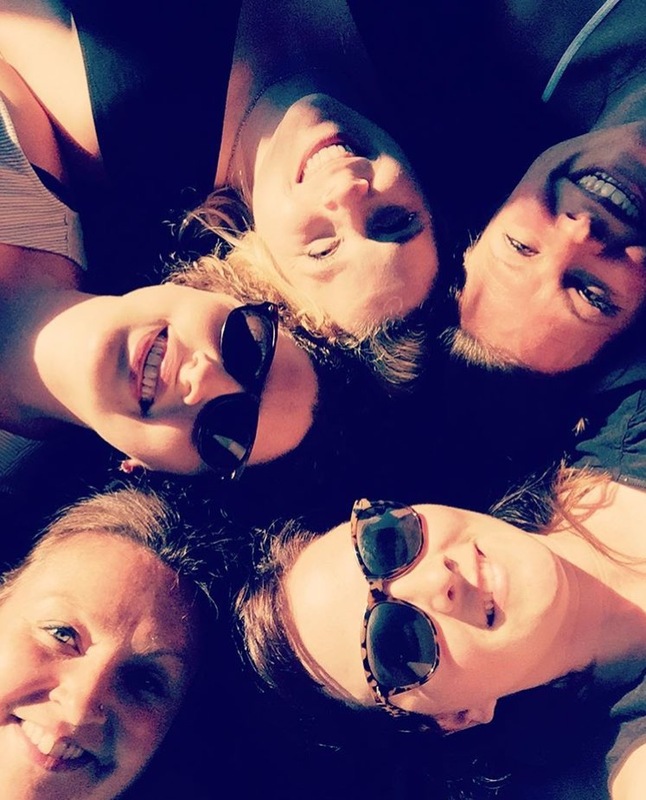 It was THE perfect gals week at the cottage (cooler weather and gale force winds included) and I have again confirmed that I could be a beach bum 365 days a year for the rest of my life! Now...where did I put that lottery ticket?! You arrive at the cottage, walk around the side and come face to face with this....I can honestly say that I felt every ounce of stress and worry leave my body at the sight of this. As you can see from the photos, we really had quite a mix of weather. Saturday and Sunday were everything you could want in a beach day and more. Monday got a wee bit chilly and Tuesday & Wednesday were windy, chilly and reminded me of Fall. But, it's the cottage...you make do with whatever Mother Nature throws at you, whether that means bathing suits and sunscreen or sweatpants, sweaters and blankets (note the goosebumps on my legs...that was an evening that really did call for long pants). The waves were mesmerizing and one afternoon, we decided to jump in and throw ourselves into them! I haven't laughed that hard in a long time...nor had I had such a good workout either as the undertow was incredibly strong. It was a battle staying on our feet at times in the shallower sections. Seeing as we were about 5 minutes south of town, we decided to head in on Tuesday to do some shopping. Yes...it's shocking...a gals week and shopping is involved ;) I'd be much more shocked (and concerned) if there hadn't been any! Welcome to Sauble! I hadn't been there in well over a decade and I felt old highschool memories come flooding back. We 'walked the strip', popping in and out of stores. We went to one called The Patch (there's one in Guelph too!) and as you walk in, there's a huge wall of friendship bracelets...so of course, in all the charm and cheesiness that comes with gals in their 30's away for a week of fun and frivolity, we got ourselves friendship bracelets! THE MOST AMAZING POUTINE I've had in a veryyyyyy long time!! And...the lady that sold us these oh so yummy morsels assured us that calories did not count on Tuesdays (*wink wink*)! Whoot whoot!! I don't know if I should admit this or not....but we went back Wednesday too....and ordered a smaller portion...a barely smaller order of fresh cut fries, covered in ooey gooey cheese and scrumptious gravy.. I am practically drooling as I write this just thinking about them! Yes, we did treat ourselves, but we actually made most of our meals at the cottage. We all took turns making dinner and the night we decided to make chicken kebabs on the BBQ, was very...how do I put this....entertaining! Flames shooting out the back!! YIKES!!! After a moment of panic, we shut off the propane and let it burn itself out. Was that grill ever clean after that! We proceeded to make the kebabs without incident and had a very scrumptious (and healthy) dinner. After our dinners every night, weather permitting, we'd head down to the beach to watch the sunset and have a campfire...two of my favourite things to do while at the cottage. We sure had some amazing sunsets while we were there! The campfires were key, as the evenings were quite chilly and of course, what would going to the cottage be without s'mores? We packed up, tidied up and did one final walk to the lake and then back through the charming, rustic cottage we had called home for the past few days. It felt like stepping back in time when you were inside the cottage....Almost every detail was original, from the solid wood doors, to the trim, to the floor, the fireplace and the windows. It reminded me a lot of our cottage/'camp' we had growing up. I had to snap a photo of the view out of one of the front bedrooms, through the wood french doors..it captures that 'feeling' I'm talking about... We also found an old photo of the cottage's exterior in all of its original glory! It was such a great time....full of laughs, chats, sunshine, sand, fun, great food/drink and of course, rest & relaxation! Thanks so much gals for making our week away together one to remember! Now...Let's get planning next year! I'm heading to the lake for a week of sand, sun and R&R with some gal pals. While I won't be blogging, keep an eye on my Instagram and Twitter feeds for some photos and updates of what we're getting up to. I'm looking forward to reading (I have enough books and magazines with me to keep me busy for a month vs a week), catching some rays (wearing sunscreen of course), walks along the beach and truly relaxing with nothing to worry about except, "what's for lunch?" When we were kids, every year at Christmas time we'd load up a sleigh with all the neighbours and go for a night time sleigh ride, pulled by two Clydesdales, with us all bundled up in snow suits and under blankets, looking at the stars and hoping we'd see Santa fly over. Every Fall, I make a point of going back to my alma mater, the University of Western Ontario/Western University, for the Homecoming football game and festivities...I still can't believe it's been 12 years since graduation. One of my favourite traditions though, is the annual trip to the beach with my gal pal Kristy for our birthdays. She's one day older than me and we've been celebrating together since we met in grade 9. I'll never forget our 16th birthday....we arrived home to my house to a Pacer...yes, a car that was older than both she and I at the time, and we proceeded to do everything in our power to get that car stuck in the muck, somewhere on the 50 acres...and get it stuck we did!! As we've gotten older, we no longer try to get cars stuck (though we still have between then and now...gotta love Country Gals) and we definitely don't get to see each other nearly enough....so when we do, we make the most out of every minute! This year, for a bit of a milestone birthday for us both, we headed up to Port Elgin (another town that holds lots of memories for us as that was one of our 'go to' lake towns growing up) and Southampton to spend the day with our toes in the sand and the sun on our face. We had breakfast down on the water at a little resto that's been in the Port Elgin Harbour as long as I've been going there (ie. well over 30 years), we wandered out the break wall, down the beach and just relished the time re-living and remembering almost 20 years of friendship! Get Kristy and I together, even after months of not seeing each other, and it's like we just saw each other yesterday. We are quite a pair of Gemini 'twins', always encouraging one another to dive right into life and get our feet wet! She has such cute, tiny feet!! Cheers to great friends, Cheers to traditions and Cheers to the memories that those friends and traditions bring into our lives! The Friday and Saturday of the April long weekend involved running errands, decorating for Spring and some relaxation. After all that, a sunny Sunday meant only one thing...ROAD TRIP TO THE LAKE!!! Mom, Charlie and I hopped in the truck (Char is never one to miss a good road trip, especially one that MAY include swimming - this one didn't as the lake was much too cold) and off to the lake we went. We started in Kincardine, along Lake Huron, and I just couldn't wait to put my feet in the sand!! As you can see, Charlie had his leash on and he was none too happy about that, but as you can also see, there are still chunks of ice in the water! Last thing we needed was a hypothermic pooch!! How great did it feel to finally be able to wear flip flops and have our toes....and tail.....in the sand!?! It wouldn't be a trip to the lake without ice cream!! An Oreo Blizzard for myself, ice cream cone for Charlie and a pineapple sundae for Mom! Feels like Summer has officially started (well....almost!). Back into the truck for a drive along the shore..... So many new homes and 'cottages' have gone up over the past 5-10 years....The one above is one of my favourites on the drive between Kincardine and Point Clark. The colours this time of year are unlike any other! You will rarely see the water this turquoise-blue in the summer. I can't get over how much ice there still was (and snow for that matter). It really was a perfect picture taking day!! We arrived home to this sunset...Just stunning! The perfect end to the perfect day! Monday morning arrived (last day of the long weekend) and I headed back to the city as I wanted to get my yard work done and the deck/patio set up! As I got to the end of my parent's sideroad, this happened as the sun was rising....I absolutely had to get out and capture how incredibly beautiful it was!